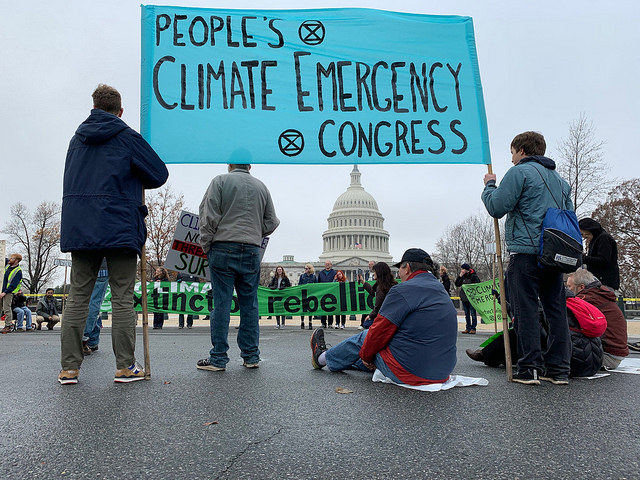 Washington, DC—The release this fall of several new reports on the effects of climate change has given a new sense of urgency to the climate movement. Even though some say the reports may still be too conservative in their findings, scientists finally seem to be hitting the panic button, concluding that the next decade is humanity’s last chance to avert the most dire effects of climate change. Worse news piles upon bad. The emissions targets set forth in the Paris Agreement won’t achieve the goal of limiting warming to 2° C, and few countries are keeping their commitments anyway. Even worse, the 2° C goal is too high to begin with; the IPCC report makes the case that there’s a big difference between 1.5° and 2° C of warming, with the higher limit meaning extreme suffering and death for hundreds of millions of people and the extinguishing of vital life-sustaining ecosystems. And if we really want to get serious about it, our entire global economic system has to be transformed. As the climate science has piled up and hurricanes and wildfires have raged, people have become more and more angry, not only at the climate deniers, but at the moribund climate movement led by “Big Greens.” For years, it has put climate change far in the future and used hope as a motivator (“if we act now, we can prevent climate change”), and offered little for people to do besides write donation checks, change their light bulbs and vote Democratic. Out of this anger and frustration, new movements are rising. One of them is Extinction Rebellion (XR), which originated in the UK last spring. It’s re-framing the climate movement as a battle for survival. “This is our darkest hour,” XR’s Resolution begins. “The science is clear: we are in the sixth mass extinction event and we will face catastrophe if we do not act swiftly and robustly.” The shorter version was written on a banner and hung from the Westminster Bridge in London. “Climate change: We’re fucked,” it said. Some are criticizing XR as nihilistic and “privileged” for abandoning optimism (those living on the frontlines of climate change impacts don’t have the luxury of giving up hope, says Jamie Henn of 350.org), but a bolder approach grounded in realism and appealing to moral responsibility seems to be taking root. “We understand that positivity used to be a call to action. But it does not work when faced with ecological and societal collapse … business as usual is no longer an option, least of all for our movement,” read a missive delivered to Greenpeace offices in London. XR UK exploded in London last month with a series of protests aimed at getting attention with large numbers and bold action. At least 6,000 people staged demonstrations, blocked roads and bridges, while some glued themselves to government buildings. Gray said that other organizations have tried to work within the system to make change, but that has gotten us nowhere. There’s been little progress, and the fossil fuel lobby still controls the government. “We’re saying we will change the system itself through nonviolent civil disobedience,” he said. XR wants to pressure the U.S. government to act, not appeal to it. If the movement in the U.S. gains steams, we might see road closure, blocked infrastructure and “gunking up of the system,” as Gray put it. The People’s Congress convened at the intersection of First and South Capitol Streets on the east side of the Capitol building, or more accurately, in the middle of the intersection to block traffic. (Some had prepared to be arrested in case police took action. They were more preoccupied, however, with cordoning off preparations for President George H.W. Bush’s state funeral.) 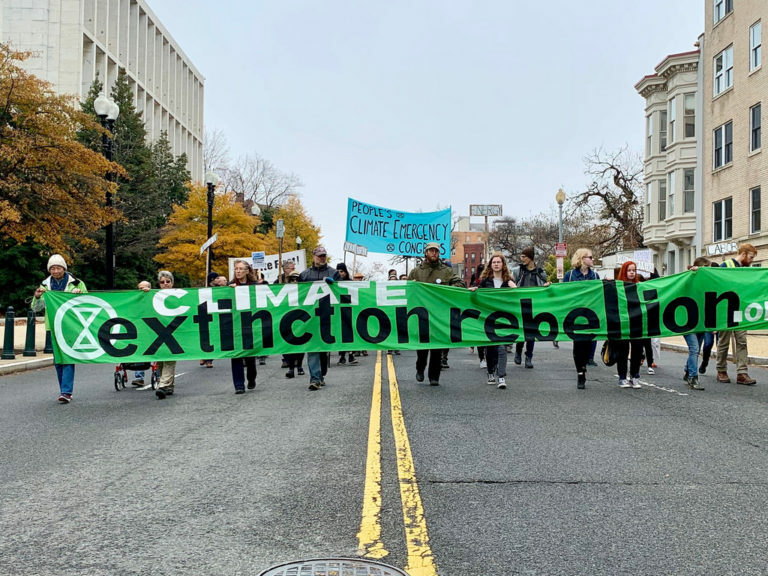 Some of the roughly fifty people attending wore symbols of the Extinction Rebellion on their shirts: green hour-glass with a black outline–a representation of time that is running out on humans’ opportunity to stop the climate crisis before it ends life on the planet as we know it. 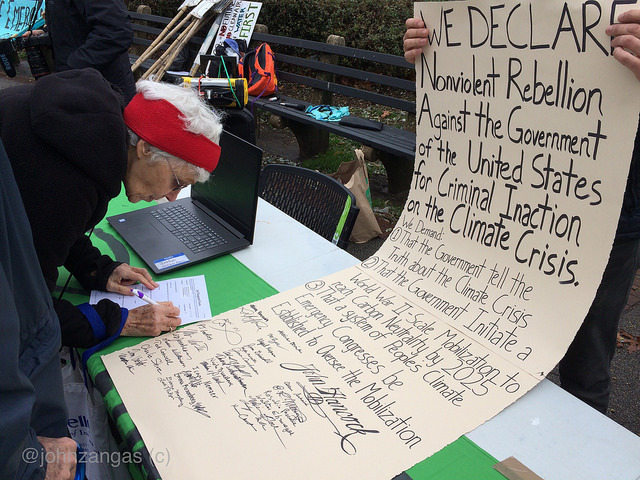 “We declare nonviolent rebellion against the government of the United States for criminal inaction on the climate crisis. That the government initiate a World War II-scale mobilization to reach carbon neutrality by 2025. They broke into seven issue committees representing conservation, carbon capture, labor, justice, transportation, agriculture and energy. After discussion, they each presented measures to address the climate crisis. Unsurprisingly, many of the committees overlapped in their recommendations. Energy measures included transitioning to renewable energy sources by 2025, leaving fossil fuels in the ground, banning new fossil fuel infrastructure, eliminating fossil fuel subsidies, and a carbon tax. $1 billion should be invested every year in carbon capture technology and make protecting the Amazon a high priority. Justice and labor issues included full employment, guaranteed basic income, promotion of indigenous rights and the right to organize. Agricultural transformation included promoting veganism, eliminating pesticides, promoting soil health and insect proliferation, promoting “ugly” fruits and vegetables, and incentivizing “victory gardens.” For transportation, electric cars and high-speed rail are a priority while banning short air travel and enforcing congestion charges in every city. Conservation measures included a ban on single use plastics, a ban on mining, logging and fracking on public lands, and a green jobs program. XR contrasts with the Sunrise Movement, a group organizing young people on the climate issue to work within the system, focusing their efforts on voter registration, GOTV and “electing real leaders everywhere.” After some electoral success in the midterms, Sunrise now seems wedded to the new Democratic progressives and the Green New Deal touted by Alexandria Ocasio-Cortez. Extinction Rebellion, on the other hand, has formed to work outside the system but pressure government to do what it ought to address the climate crisis. It will need more numbers and a great deal more diversity to achieve disruption on a large enough scale. Given the energy behind XR UK, though, the small People’s Congress convened in Washington on Sunday may have been an auspicious beginning. I drove down from NJ with former Green Party congressional candidate Diane Moxley. While we expected bigger numbers it was definitely worth the trip. Great energy, good amount of young people, well organized. Was surreal being able to observe military practice for Bush funeral from where we held congress.